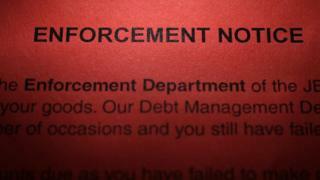 Some bailiffs are still abusing their powers when trying to recover debts, despite changes to the law three years ago, say debt advice charities. The laws to regulate bailiffs in England and Wales were aimed at protecting debtors from any unfair behaviour. But a consortium of charities says these new rules have failed to rein in some rogue bailiffs. One industry body said the system had improved but could be better. The government will soon begin a review of the laws. Bailiffs are typically used by creditors, on the authority of the courts, to seize property if debtors fail to pay what they owe. The 2014 laws should have provided debtors with protection against over-aggressive bailiffs. For instance, the current laws ban bailiffs from entering homes at night, acting without proof of identity or lawful authority, or trying to impose unauthorised fees. But a report called Taking Control, compiled by the charities, said that some bailiffs regularly intimidated debtors, failed to accept offers of payment and also failed to take account of whether a debtor was particularly vulnerable. Joanna Elson, chief executive of the Money Advice Trust, said: "We continue to see widespread problems with the behaviour of bailiffs and bailiff firms. In its three-year review, the government now has the opportunity to deliver the fundamental bailiff reform that is needed to resolve these problems." Citizens Advice chief executive, Gillian Guy, said: "Harsh tactics by bailiffs can cause severe distress and push people even further into debt. "Local authorities have a key role to play in stamping out bad practices - by treating people in arrears fairly and ensuring bailiffs are only ever used as a last resort." The charities that compiled the report included AdviceUK, the StepChange debt charity and the Children's Society. Together they have called for the establishment of an independent regulator for bailiffs, and a single and simple way for people to complain about over-zealous bailiffs. The use of bailiffs to enforce the recovery of debts is still widespread, with unpaid council tax being a particularly common reason. Between 2014 and 2015, councils in England and Wales asked bailiffs to pursue debts on 2.1 million occasions, the charities say. An HM Courts and Tribunals spokeswoman said: "The government is clear that aggressive enforcement action is not acceptable. "Protecting the rights of the public is our top priority, which is why we've introduced robust rules on what goods an enforcement agent can or cannot take, how and when they can enter premises and what fees they can charge." Claire Kober, chairwoman of the Local Government Association's resources board, said that anyone who felt that a bailiff working on behalf of a local authority had acted illegally or been intimidating should contact the council concerned immediately to raise their concerns. Vernon Phillips, director general of the Civil Enforcement Association (CIVEA), which represents private sector agents, said: "It is clear from the most recent local authority survey evidence that the system is working better than before the new regulations came into force, but we are keen to ensure any continuing concerns are tackled effectively. "We are currently in conversation with the advice sector organisations, and we are hoping that they will be able to share specific evidence with us of where practice can be improved, so that we can work with them to do that."